Even for those of us who love to cook, there always seems to be something getting in the way of indulging in our passion. It’s too cold to go grocery shopping, we’re too busy with work to find time to cook, or sometimes we just feel uninspired by the recipes we have at hand. Cooking is one of the most basic of human activities, yet with so many other options to keep our stomachs full, we find ourselves, perhaps for the first time in history, asking “why cook”? Let’s talk practically. We’re all concerned about the quality of the food we eat, right? Then let’s keep reminding ourselves that cooking it from scratch is truly the only way to know what we’re feeding our bodies. Plus, it’ll save us money every time: a home-cooked meal will always get us better value than restaurants and takeout. A home-cooked meal is more than just food. It’s a gift to cook for others – and wonderful to be cooked for. Our childhood memories are filed with moments in the kitchen, the liveliest room in the house, a perfect place for family and friends to learn what’s going on in each other’s lives. 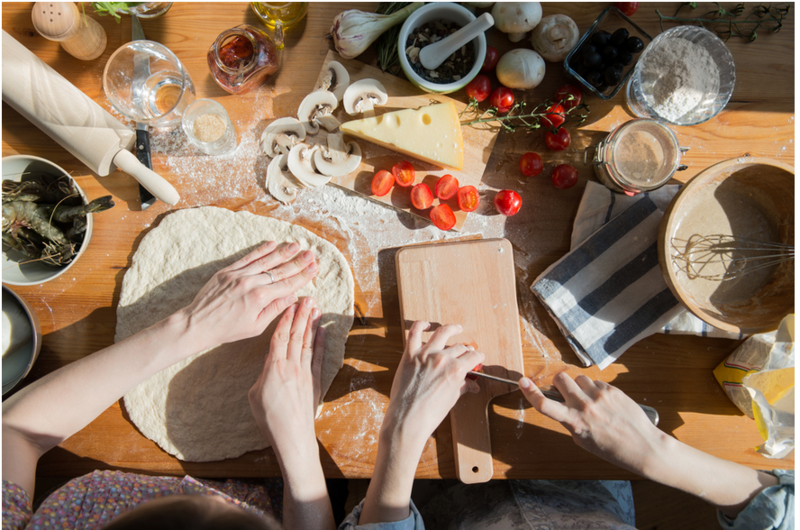 After a long day’s work, cooking is also a creative outlet for many of us, a way to focus our minds on the present, letting go of stress and restoring energy. It’s a joy born of the pleasure of using our senses – running our hands through a bunch of herbs, hearing the sizzle of a pan, seeing vegetables change colors as they cook, filling the house with the aroma of sweating an onion. The best part? These small but stellar moments don’t discriminate – they occur in even the simplest of recipes, allowing the beginner and expert cooks to experience them in the same way. • There’s no greater buzz kill in the kitchen than a dull knife – make sure to get yours sharpened every few months!